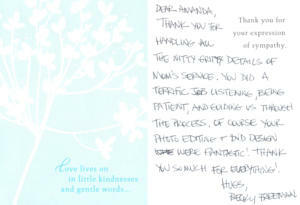 Thank you for handling all the nitty gritty details of mom’s service. You did a terrific job listening, being patient, and guiding us through the process. Of course your photo editing and DVD design were fantastic! Thank you so much for everything!